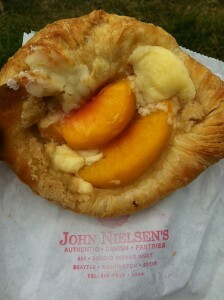 I recently jumped at the chance to check out John Nielsen’s Authentic Danish Pastries in Lower Queen Anne. The majority of my ancestors are from Scandinavia and I’m very proud of my Norwegian, Danish and Swedish roots. I’ve also spent some time in Denmark (traveling and visiting family) and have had my fair share of Danish pastries. I was eager to try out the pastries and see just how authentic they are. 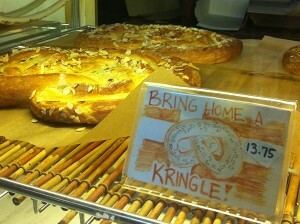 An apple Kringle at Nielsen’s Pastries. Before I get into the food, I have to give a shout-out to the staff at Nielsen’s Pastries (520 2nd Ave. W.). The customer service is top-notch and they know how to over-deliver. Tim and I actually visited this place on my birthday. When the employee asked what we were up to, Tim told him it was my special day and he gave me a free pastry. Tim wasn’t doing this to get a freebie. He was just looking to draw a little bit of attention to me (how sweet), but the staff responded in a great way. They were also very helpful answering all of our questions about the pastries. You don’t often find this type of thoughtfulness with food and beverage service. I plan to go back based on this experience alone. The fruit and cream cheese danish at Nielsen’s Pastries. However, there is another reason why I will be returning to Nielsen’s Pastries. The pastries are the real deal! They are out of this world fresh and so authentic! I felt like I was right back in Denmark, visiting with my cousins, and enjoying a Danish pastry. I indulged in the cream cheese and fruit Danish. The pastry was warm and flaky, the fruit was fresh, and the cream cheese was so smooth and buttery. I should have ordered two. Tim tried a slice of the apple Kringle which is a traditional folded Danish pastry filled with chunks of apple and garnished with sliced almonds. Tim enjoyed his pastry as much as I enjoyed mine. Nielsen’s Pastries has been in business since 1965, and it clearly takes pride in its heritage with Danish decorations throughout the bakery. Everything is hand-made with authentic recipes using fresh ingredients, creamy butter, house made jams and I’m sure a lot of love. You can tell the staff puts a lot of effort into making great tasting pastries and delivering great customer service. I will be back to indulge in another pastry soon (and I’ll continue going back again and again). Have you ever tried a pastry at John Nielsen’s Authentic Danish Pastries? Was your experience as great as ours? We’d love to hear from you! Let us know what pastry you tried by leaving a comment below or connecting with us on Facebook, Twitter and Google+. Don’t forget to also check out Seattle Bloggers for more great places to eat and drink in the Emerald City and around the Puget Sound!